In accordance with reconciliation deal with Israel, court in Istanbul drops case against IDF commanders being tried over Marmara raid. 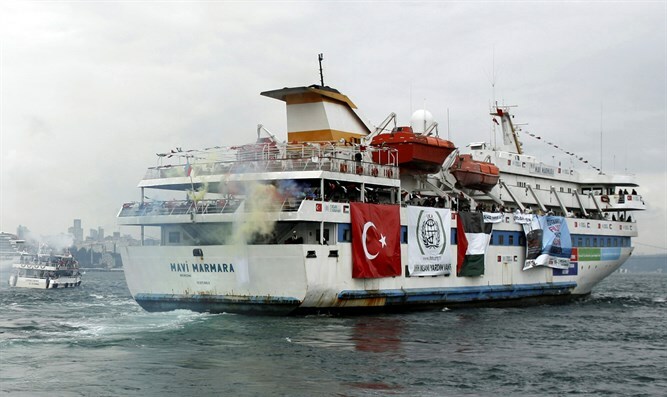 A court in Istanbul on Friday dropped a case against four top former Israeli commanders who were being tried in absentia over the 2010 raid of the Mavi Marmara ship bound for Gaza, AFP reported. Dropping the charges against the Israeli commanders was a key pillar of a deal agreed between Israel and Turkey this June to normalize bilateral ties. As part of the reconciliation agreement in June, Israel also paid $20 million in compensation to Turkey for the Marmara incident. In addition to the lawsuit being dropped, an arrest warrant for the four charged was also withdrawn, Gulden Sonmez, a lawyer for the victims, wrote on Twitter after a closed door hearing in Istanbul. Mustafa Ozbek, a spokesman for the Humanitarian Relief Foundation (IHH) group which organized the flotilla in 2010, confirmed to AFP that the case had been withdrawn. Prosecutors had been seeking life sentences for the alleged involvement of former IDF chief of staff Gabi Ashkenazi, former navy chief Eliezer Marom, former military intelligence head Amos Yadlin and former air force intelligence chief Avishai Levy, who went on trial in absentia in 2012. Before the verdict was read out, tumult erupted in the courthouse as lawyers and supporters of the victims denounced what they said was a travesty of justice, according to AFP. Lawyers and families walked out of courtroom shouting "damn Israel" and "Mavi Marmara our honor". Under the agreement signed in June, Israel also agreed to allow Turkish aid to reach Gaza, and both sides also agreed individual Israeli citizens or those acting on behalf of the Israeli government would not be held liable -- either criminally or financially -- for the raid. Meanwhile, Turkish Prime Minister Binali Yildirim's policy advisor Kemal Okem will start work as Turkey's ambassador to Israel in the next days. Despite the reconciliation deal, Erdogan refused to tone down his anti-Israel rhetoric in an interview with Israeli journalist Ilana Dayan two weeks ago, even as he called for a “new page” in Israel-Turkey relations. In the interview, Erdogan refused to take back his past verbal attacks against Israel, including a statement that Israel’s attacks against terrorist targets in Gaza during Operation Protective Edge were more barbaric than Nazi leader Adolf Hitler’s actions. Nevertheless, Erdogan and Israeli President Reuven Rivlin held a phone call last week, during which Rivlin thanked Erdogan for his country’s assistance in fighting the recent fires in Israel.